The countdown is on! 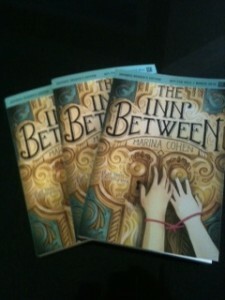 One month to the date to the official release of The Inn Between! And what better way to mark this special occasion than to do an ARC giveaway?!! I have been guarding (okay, more like hoarding, holding, hugging…) three advanced reading copies of The Inn Between and now it’s time to let one or two (have to keep one for myself!) fly out into the world! And for an extra special bonus, you can choose one of these lovely friendship bracelets (Sorry for the tiny images!) that have a silver clasp that says “hope” because ultimately, I wanted my novel to end on that note. Hope. How do you enter? Simple. Just add a comment here, or comment on my Facebook page, or go to twitter and retweet! Contest will be open one week–until February 29th–when I will draw the lucky name(s). Thanks for popping by and good luck! « OLA Super Conference 2016!